A mental disorder primarily described as a pathological guilt or an obsession related to moral or religious issues which often include compulsive moral, or religious observances, and may be highly distressing. Preoccupied with details, rules, lists, order, organization, or schedules to the extent that the major purpose of the activity is lost. A "perfectionism" which interferes with the completion of an objective; such as, being unable to complete a project because one's overly strict standards are not met and so, showing rigidity and stubbornness. Being excessively devoted to work and productivity to the exclusion of leisure activities and friendships which do not involve an economic necessity. Being unable to throw away worn-out or worthless objects; even when they have no sentimental value. Having an overconscientious, scrupulous, and inflexible attitude about matters of morality, ethics, or values all of which have nothing to do with any cultural or religious associations. 1. A reference to having a mental disorder which is primarily described as an obsession related to moral or religious issues which often include compulsive moral, or religious observances, and may be highly distressing. 2. Descriptive of being overwhelmed by personal orderliness, perfectionism, and mental and interpersonal control, all at the expense of flexibility, openness, and efficiency. A psychological disorder characterized by pathological guilt about moral or religious issues. It is personally distressing, objectively dysfunctional, and often accompanied by significant impairment in social functioning. 1. A moral or ethical consideration that tends to restrain one's action or behavior. 2. An uneasy feeling arising from one's conscience or principle that tends to hinder action a certain less than acceptable behavior. 3. A doubt or hesitation as to what is morally right in a certain situation. 4. A minute (tiny) part or very small amount. 5. A unit of apothecary (drug store) weight equal to about 1.3 grams, or 20 grains; or 1/3 of a dram, abbreviated as, sc. or scr. 6. Etymology: coming from the 1520's, from Old French scrupule, which came from Latin scrupulus, "uneasiness, anxiety, disturbance of the conscience"; literally, "a small sharp stone"; from scrupus, "sharp stone or pebble". This was used figuratively by Cicero for a "cause of uneasiness" or "anxiety", perhaps from the notion of having a pebble in one's shoe. A more literal Latin sense of "a small unit of weight" or "measurement" is certified to have been in English from the late 14th century. 1. To hesitate to act, or to refrain from taking action, because of moral or ethical considerations. 2. To delay doing something because of thoughts about what is right or wrong. 3. 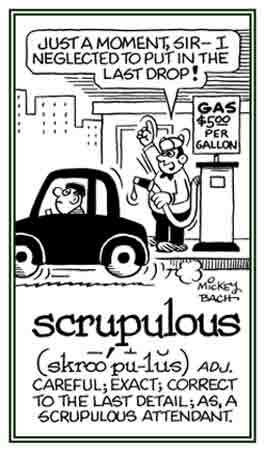 To hesitate as a result of one's conscience or principles about doing something bad: "The man scrupled about perjuring himself; but, after he lied, he didn't scruple about it anymore." Being without a moral principle that prevents a person from doing something that is considered to be bad or immoral. 1. A person who is extremely honest and principled: "He was a scrupulist who would never take advantage of anyone." 2. Anyone who is characterized by painstaking efforts and attention to details: "After several years of scrupulous research, this scrupulist finally finished her book". 1. A condition of doubt; that is doubtfulness respecting decisions or actions. 2. Caution or tenderness regarding the fear of doing something wrong or offending someone. 3. Having regard for exactness and propierty; being precise. 1. A reference to a person who is cautious about his or her actions for fear of doing something wrong; conscientious: Because Sharon is a scrupulous editor, she never misses any grammatical mistakes or misinformation when she proofreads articles for her newspaper. 2. Relating to a process which is exact, precise, and very careful: Richard's occupation as a bookkeeper requires a scrupulous attention to details. 3. 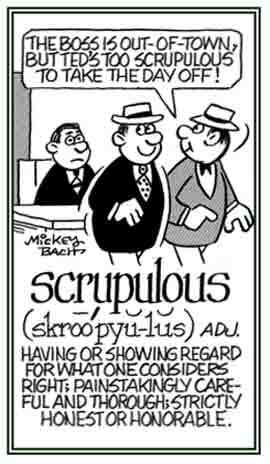 Etymology: from Latin scrupulus, from scrupus; literally, "rough pebble"; figuratively, "anxiety". © ALL rights are reserved. 1. Conformity to high standards of ethics or excellence. 2. Paying strict attention to minute details. 3. Conscientious regard for duty, truth, propriety, or exactness; specifically, an attention to the dictates of one's conscience when making a decision or taking an action. 1. A reference to someone who is willing to do things that are unfair, dishonest, or illegal, or whose conduct shows such corruptness: Jack's neighbors were quite unscrupulous because sometimes they would dump their garbage over the fence into his garden! 2. Etymology: from Latin un-, "not" + scrupulous, "ethical, trustworthy." © ALL rights are reserved. A descriptive term for someone who is not honest or fair and who does things which are wrong, dishonest, or illegal. 1. Lacking honesty and being unaware of what is honorable and proper. 2. 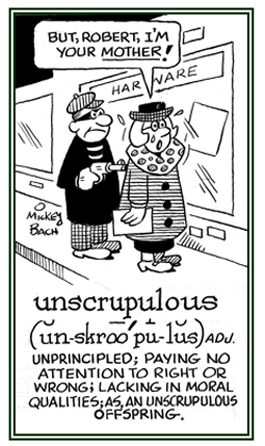 Being without scruples and oblivious to or contemptuous of what is right or honorable. 3. Not restrained by moral or ethical principles and so, being unprincipled: "There are too many politicians who are motivated by an unscrupulousness and who will do anything in order to gain power."